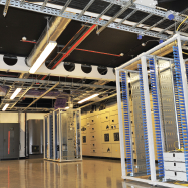 The critical power path within a data centre runs from the building incomer through LV switchboards, uninterruptible power supplies and power distribution units to the IT server racks it will ultimately power. To achieve the right electrical design, with no single-points of failure and the resilience required for the data centre’s Tier rating from the Uptime Institute requires the type of approach offered by professional data centre power consultants such as EcoPowerSupplies. The EcoPowerSupplies team has over 60 years experience as data centre power consultants and has been involved with the design and installation of electrical power within a number of high profile data centres in the UK. Our installation experience includes both AC and DC circuits, uninterruptible power supplies, static transfer switches (STS), battery sets, generators and power distribution units, with remote monitoring and DCIM software package integration. As well as providing a complete power continuity design, planning and installations service, EcoPowerSupplies also provides after sales services including: UPS battery testing and maintenance contracts for any installed uninterruptible power supplies, generators and even LV switchboards. The EcoPowerSupplies team includes engineers certified to provide IEE 17th edition electrical services as well as certified UPS service engineers. Our project consultants have spent many years within the data centre industry, achieving the highest qualification levels including Certified Data Centre Design Professionals (CDCDP) and Certified Data Centre Energy Professionals (CDCEP). When it comes to uninterruptible power supplies, as data centre power consultants, we would nearly always suggest modular UPS systems. The modular approach provides a more easily scalable power solution than mono-block type systems as well as parallel N+x resilience, all within a small footprint frame. EcoPowerSupplies provides a complete design and audit service and our expertise in critical power and energy efficiency is guaranteed to save you time and money, reduce your energy consumption and increase the overall resilience of your data centre operations. For more information or to request a free data centre audit for energy efficiency or critical power resilience, please contact us on 0800 612 7388.